We had a deluge of snow in Toronto today. Estimates range from 20-30 cm before drifting. Since it's Sunday, there are no closures of schools or offices. Monday looks like a normal day. At least I got to use our snowblower. Twice. I also helped shovel a retired neighbour's driveway. This was much more useful than giving him a shovel or a cup of hot cocoa. Often, we take the easy way out, giving a material gift. "Thanks for the ball, dad, come on let's play. Can you teach me to throw?" You are the best gift you can give. Granted, this is tough to explain to a kid dreaming of a Wii or iPod. No one can outspend us when we give time and attention. Not even a billionaire. When giving, don't forget to give yourself to yourself too. This is my final post of the year. Thank you, dear readers, for giving me your precious attention, week after week. All the best to you and yours during the holidays. May your 2008 be really great! 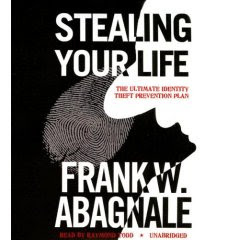 In Stealing Your Life, Frank Abagnale discusses identity theft. His autobiography, Catch Me If You Can, became a Steven Spielberg movie starring Leonardo DiCaprio. Abagnale also wrote The Art Of The Steal about protecting yourself against fraud. Cheery topics indeed. Stealing Your Life is less entertaining than the earlier books because it's closer to our lives. Also, we've heard the messages before. The content has an American slant and there's more "product placement" (a particular pen for writing cheques) and endorsements (e.g., a particular paper shredder). Fortunately, there's no reason to carry either around with us. Very few places legitimately need to know. Unfortunately, too many of us carry such vital identification with us and share it too easily. Use a credit card rather than a debit card. Once money's been taken out of your bank account, it's tough to convince your bank that you weren't negligent. After all, the debit card is supposed to be in your physical possession and only you have the PIN. Right? The Federal Trade Commission estimates that fixing your credit costs $1,200 US and 175 hours of your time. I'm now reluctant to use my credit card in restaurants and other places where my card leaves my sight. There's not much choice unless you want to carry extra cash. As a precaution, I use my backup credit card. Earlier, I wrote about your credit report. Abagnale recommends a regular review to make sure nothing's amiss. He points out that credit agencies are businesses. They do not take responsibility for ensuring the accuracy of the records they hold. Different agencies can have different information about you. You can get your credit report by mail for free or pay to see it online. The advice above comes from a retired husband/wife team that owned and operated a small business. One is a retired professional accountant. With taxtips.ca, their goal is to be "a reference site for easy to understand tax, financial, and related information." That's commendable. They say: "Interest income (t-bills, GICs, bonds, etc.) and dividends from foreign corporations attract the most income tax, because the total amount is included in taxable income. Thus, if you want to hold this type of investment, it should be held inside the RRSP." You've probably heard this advice before. Even so, you may have mutual funds inside your RRSP and GICs outside. Maybe you want liquidity. Maybe you want the maximum growth in your RRSP. Maybe you want short term investments outside. People have different reasons. This post isn't about the psychology of investing. You can also put your most taxed investments into universal life insurance, an option you lose if you "buy term and invest the difference". As with an RRSP, the growth is tax-free until withdrawn. Like a Guaranteed Interest Certificate (GIC), you have a choice of terms --- often 1-5 years or longer. These investment choices are usually called Guaranteed Interest Accounts (GIAs), to distinguish them from GICs. I couldn't find a nice online comparison for you. There are plans that guarantee minimum interest rates of 4%. How's that for tax-free growth? It's the time of year when many spend on others ... and themselves. Without self-restraint, the January bills can be a downer. Since the days when you could say "Merry Christmas" without offending anyone, we've celebrated the special, joyous holiday season. Good will towards all. We had a tree and presents. In the early 1980s, I started celebrated Boxing Day instead. At Sam The Record Man where everything was on sale. And stereo equipment stores. Remember these were the days before VCRs, computers and even audio CDs. Nowadays, even Boxing Day has lost its charm. Retailers like Best Buy and Future Shop start their sales online on December 25th. Boxing Day sales start at crazy times like 7am --- with lineups! Big ads and long lines don't mean big savings. If you don't know the regular selling prices, you could overpay for an item on "sale". Last year, I indulged in a GPS navigation system. I started researching in the fall and monitoring prices. Prices dipped lowest in late November/early December. That's when I bought. On Boxing Day and beyond, discounts off the normal prices were smaller. On Boxing Day, I saw brands I'd never seen before or since. Retailers must bring in items they didn't normally stock just to mark them down for unwary customers. Naturally, buying is easier than paying. It helps to know how much you can afford before you go shopping. Some items decrease in price or improve in quality. Computers, for example. You can benefit by waiting. If you bought an item on impulse, wait 48 hours before opening the package (assuming it won't go bad, you have self-control, and it's returnable). You can pretend you bought online and are waiting for delivery. If you lose interest, return the item. This works very well for me. Right now, here's what's going back unopened: car DC-to-AC converter, aluminum computer case and a backpack. They may soon be joined by a LED flashlight you can recharge by winding up. The following passed the wait: nonstick cookware, vacuum cleaner. They were worth the wait. Read other posts on holiday spending from the Canadian Tour of Personal Finance Blogs. you just wish the trip was through. Life's tough on the road even when you're a big rock star with an entourage. Imagine the plight of a personal finance blogger --- in Canada. No personal jet. Not even a tour bus. Instead, we travel in cyberspace. Here's the good news for you: admission is free. You simply visit one of the sites on the tour and follow the links to the other "performers". The organizer, Monty Loree of Canadian-Money-Advisor.ca has suggested a timely theme: views on holiday spending as it relates to personal finance. Drop by on Tuesday November 27 and see the results. And these towns all look the same. Do you write about Canadian personal finances? How about joining the joining the tour, here's the registration page. Oh no! Your car broke down. You've got no idea what's wrong. The problem could simple or major. You're told that repairs will take three days but they take four and cost you $1,000. Getting around is inconvenient but you manage. You pay, feeling the bill is reasonable for the amount of time and effort. You don't realize that the mechanic was average. Most of the time went to finding the problem. Suppose you go to an exceptional mechanic instead. This mechanic fixes your car in 10 minutes. How would you feel about paying $1,000? Chances are you'd balk. A $1,000 for 10 minutes of work? Ridiculous! But is it? You got your car fixed in less time than a pizza delivery and you saved four days of aggravation. Wisdom takes years to acquire and has a cost. We can't easily measure wisdom and don't have two identical cars to take to the two mechanics. Our usual solution? Pay for the time expended. So we pay accountants, lawyers and others by the hour. We pay for effort rather than results. When we looking for our first home, we met a real estate agent at an open house. We described our needs and wants: close to public transit, quiet, large, within our budget. The first place our agent showed us was ideal. So we did the obvious --- kept looking. After a few more days of visiting other places, we bought the first place. We now accepted that our agent was excellent. We didn't know before. The result? Wasted time. Ours and our agent's. When I get logical, and I don't trust my instincts — that's when I get in trouble. Using a car as an example, the utilitarian elements are gas mileage, reliability and safety. The expressive elements are style, status and social responsibility. Our purchases are based on both. Buying the Sonata looks the logical choice. Let's look at 2007 car sales to Oct 31st from The Wall Street Journal. Hyundai sales dropped 12.1% to 250,885 cars. In contrast, BMW sales increased 9.2% to 188,845 cars. In October, why did Hyundai sell only 19,214 cars vs 19,084 for BMW, a difference of only 130 cars? There must be plenty of expressive drivers. The same goes for investors. Statman would like a hedge fund, for example, listed as follows: 6% expected returns, 2% hope, 2% cachet. Strange. Different titles must grab different readers. Whatever the title, the article's worth a read. Unfortunately, most Canadians are unaware or skeptical. There's a widespread belief that it’s better to buy-term-and-invest-the-difference. So affluent Canadians take advantage of UL with the endorsement of their accountants. This seems like a great idea. Term insurance is cheaper than permanent insurance. So there’s more money to invest outside. Yet astute investors like Warren Buffett buy permanent insurance, especially UL. Why is term insurance cheaper? Because it’s worth less. Coverage expires before most people do. So term insurance is well-suited for folks with young families and debts like mortgages. Term insurance is used for estate creation by people with little money. They buy term but don’t have money to “invest the difference”. They probably have unused contribution room in their RRSPs. In contrast, permanent insurance is used for estate preservation and tax planning by people with money. (For other provinces, see 2007 Tax Facts and Figures from PriceWaterhouseCoopers). As with an RRSP, the tax rate on growth inside UL is 0% until withdrawals are made (then taxed your marginal tax rate). Tax deferred is tax saved --- a huge benefit. You saw the power of tax-deferred growth above. UL lets you make deposits well above the RRSP contribution limits (the maximum is limited by the death benefit, which you select). Because withdrawals are not mandated, the savings can be paid out as part of the tax-free death benefit. If you need retirement income, you have the option of getting tax-free income by using the savings as collateral for a bank loan. You can skip the loan payments and have the loan repaid with the tax-free death benefit. If you’re accumulating large sums, do you want to risk losing it to creditors? When properly-structured, life insurance can be creditor-protected. The advantages of universal life insurance lead to many creative strategies. Seth Godin stole my ideas. Rather, we share ideas in common. His book is The Dip: A little book that teaches you when to quit and when to stick. Seth says that to succeed, be the best in the world. The solution is to pick a small enough world. That's not cheating because your clients define "world" and "best". For example, we got food poisoning after visiting the Corvette factory in Bowling Green, Kentucky. So we looked for the best medical care that was nearby, available and affordable. So we picked the best choice available to us there, not scanning the entire planet. The dip creates scarcity and scarcity creates value. So barriers-to-entry are your friend once you get through them. Too many people compromise and fail. When the going gets tough, they start something new. Rather than specialize, they diversify. They become "well-rounded". They become average. Because we have too many choices and too little time, we want the best. So We want to deal with specialists. Any other choice is risky. We don't care if our accountant is a good gardener and a decent golfer. Ditto for our car mechanic, dentist and violin teacher. There are times when quitting is the best option. Did you study French in school? I did well because language is like mathematics: obscure rules to memorize and apply. In 2005, I got a tutor to help me relearn the language. After a dozen lessons, I was still far from proficient. So I quit. Better to get better at something I was already good at. Sometimes we stick to the wrong things because we're too lazy to quit. You see people working on getting a degree or designation but failing. Again and again. 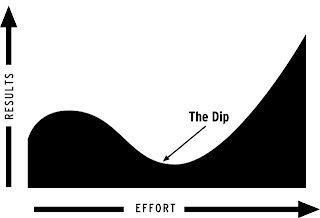 The dip is the gap between starting and mastery. Most quit in the dip or stick in a dead end. Instead, we need to stick through the dip and quit the dead ends. Winners get disproportionate rewards. Success goes to those who obsess. Health is wealth. My dad passed this message along --- fittingly --- during childhood walks. But do you really want to exercise outside in the rain, on a frigid day or in the scorching sun? Maybe you'd like to use exercise equipment too. A fitness club can help. A reader of my earlier post Fitness Clubs Exercise Your Wallet suggested a cheaper way to join a fitness club: a corporate membership. You or your spouse may qualify. You may even have a facility where you work, but family members may not be allowed. Joining a fitness club has risks. There's pressure to join. The club can go out of business, taking your money with you. We experienced both with Holiday Fitness in Ottawa years ago. We've been members of Bally Matrix/Total Fitness since 1992. Apart from the initiation fees, we've been very pleased. Our location, West Metro Toronto, occupied three floors of a modern office building with plenty of parking. Great equipment. Great staff. Great members. Great atmosphere. Last Christmas, we gave our son, then 12, sessions with an excellent personal trainer (Pino). This was terrific. We all went together and benefited. Then we waited until this month for Jeevan to turn 13. With excitement, we went to Bally's to get our son a membership. Guess what? The club was sold to Goodlife Fitness a few months ago. Can a 13 year old join? If so, what's the price? The sales rep went to check the minimum age requirements. Upon his return, he started talking to a woman who arrived after us. She was in a rush. So he started attending to her, which would only take five minutes we were told. The five minutes extended to a club tour, extraneous questions, filling out forms. Probably 30 minutes in all. We started leaving but were implored to stay since we'd be served in a minute. We waited. Goodlife does accept children but they need to take 12 sessions with a personal trainer. Since a personal trainer had already worked with our son, this requirement was reduced to six. We figured this could be negotiated down further. The price? This was a shock. At Bally's, my wife and I each paid $200/yr for a total of $400. So we figured that adding our son would increase the price to $500-600. Wrong. That's a grand total of $68 payable 26 times per year for a total of $1,768 per year. We were not offered any discounts for being Bally's members for 15 years. However some miscellaneous setup fees would be waived, but that was true for any new member. Our excitement vanished. Have prices skyrocketed? Are there other clubs for the whole family? We're investigating. We'll then exercise our options. "So many options, so little time." That's how a letter from the dealership where I lease my car starts. I'm invited to start thinking about my options as there are new models and "many new attractive leasing options". I've still got 12 months left in my 39 month lease. The dealership is certainly being proactive. They did get me thinking. Each choice includes the worst step: negotiation. How do you know you're paying a fair price? There are tips at sites like Insider Car Secrets. In The Millionaire Mind, author Thomas J Stanley reports that millionaires buy (not lease) quality used (not new) cars. Since cars depreciate rapidly, the savings from buying "pre-owned" outweigh the additional maintenance costs. Owing to poor reliability, German imports like Audi, BMW, Mercedes and Porsche make lousy choices. Buying domestic or Japanese is more cost effective. The most reliable used car, a 1998 Lexus LS400 had fewer problems than a 2006 Mercedes-Benz ML500, according to Consumer Reports. For new vehicles, the owner of the Mercedes M-class is likely to experience 10 times as many problems than with a Toyota Highlander Hybrid. Sadly, the more reliable cars are less enjoyable to drive. Naturally, there are pros and cons to each option. Luckily, there's plenty of time to decide. Too much time. SHOULD YOU SWITCH TO AN ACTUARIAL CAREER? The greener grass on the other side is probably artificial turf. 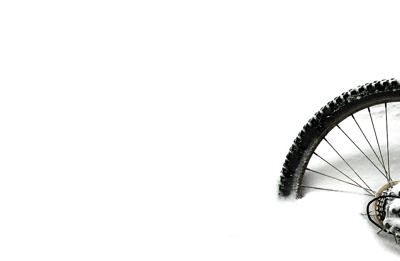 PayScale Blogs recently interviewed a prominent actuary (hint: me! ), which lead two readers to ask whether they should change their careers. Here are the emails (edited to preserve privacy) and some thoughts. "I am really interested in a career as an actuary. I was very good in math in high school and university. Unfortunately I chose the wrong field when I was 18 and graduated with a bachelor's degree in electronic engineering. I am 35 now and haven't been successful in my field and have totally lost my interest in it. I want to know with all the passion and talent that I have for math, could I start an actuarial career without going through another undergraduate program by passing the few first actuarial exams and finding an entry level job? Is there a good future in the field or are the chances very limited in Ontario?" During my research about the actuaries, I landed on your website, and whatever you wrote there made me comfortable enough to ask you for advise. So, this is what I am doing. I work as an Office/Accounting Manager for over 10 years and I got to this point in my life where I want to do something that I really like (and this is not what I am doing right now). I've always liked math (I have a bachelor degree in electrical engineering), so after considering different options I decided to try to become an actuary. On your website you wrote "coaches or mentors see us the way we can't … objectively", and this is what I want from you: to let me know if my goal is realistic, if I can do it without going through an university in day-time, if it's not too late, what should I do first, etc. I have a lots of questions, and I would like an objective assessment of my plans. As you can imagine, it's difficult to comment on another person's life --- especially when the decision is as major as a career change. It's too unfortunate when a career choice has not been satisfying. Here are some thoughts that may help you. actuarial students working at other firms (already experienced). This may seem like age discrimination, but it's more a case of finding the best candidate. You'd need to have a compelling competitive advantage to be hired over others --- especially for an entry level position. Also, the actuarial exams are rather difficult. They are designed to weed out students. You might want to try an exam to see what they are like. I hope I don't seem harsh. Actuarial science can be an excellent career choice. However, before you make a major commitment to a new field, do investigate the job opportunities further. What do you think about changing careers, something which The Money Diva is also considering? Would you rather get $10,000 today or a penny which doubles in value every day for 30 days? Phil Harriman, former senator for Maine, asked this question earlier today in Banff. Most of us would take the $10,000 today but after 30 days, the penny would grow to an astounding $5.4 million. We have trouble estimating exponential growth. What about the effect of tax on the investment growth? With a tax rate of 35% (US federal and state), the $5.4 million drops to a miniscule $20,300. We have trouble estimating the effect of tax. Static examples are interesting, but what happens if the assumptions change? We can't easily estimate the outcome. Rather than guess, find out using the calculator I created with InstaCalc (a very nifty tool for bloggers and websites). Avid readers with excellent memories may recall my earlier post on compounding, which gave more explanation of the calculations. How strange. A customer returning an item is treated better than a customer buying. As children grow up, they become more particular about clothing. In this case shoes. The preferred brand was Nike and now Adidas. The US offers more selection and better prices than Canada. So during our recent trip, shoe shopping was on the agenda. Our son needed a new pair of running shoes. The same style in a larger size. Alas, we could not find what Jeevan wanted. We visit store after store, encouraging him to try different brands and styles. No luck. He could tell what would be comfortable by just looking. Try on the shoes, we implored. He would but would repeat his initial observation. The power of preconceived ideas. On our way back to Canada, we stop at a multibrand shoe store (MSS). No success. So we head to a Nike store a few doors away and leave with a pair of shoes. Once we're out of the store, our son says he prefers the shoes we saw in the MSS. Choking a child is probably a criminal offense and there are potential witnesses. So we go back to the MSS and there our son finally finds a pair that he likes --- a pair that looks similar to his old shoes. So I head back to Nike to return the shoes bought minutes earlier. Guess what happened? When you buy shoes, the cashier checks that you have a matching pair. Since our left and right feet are different sizes, we'd be better served if each shoe was a different size but stores don't sell them that way. The return line was shorter than the two lines for buyers. The rep didn't open the shoe box to see what was inside. I got an instant refund and --- here's the surprise --- a 20% discount on another purchase within the next two hours. This is called ReturnRewards. How strange. and he sang from his soul. Whether your hobby is singing/dancing/writing, there's value to creating in solitude. But there's not much joy without interaction. To my surprise, I've been getting more feedback by email than from comments to posts. I didn't know. I generally post once a week, which makes visiting Riscario Insider daily of little value. So you're best served by subscribing for updates by email from Zookoda. If you reply, your response comes back to my sending email account. Who knew? To my surprise, I've been getting emails. I didn't know because I wasn't checking those accounts ... until today. Gmail's great because of the space, permanence, spam filtering and ease of finding messages. There's one problem: you can only sign into one account at a time and I have three. So I was only checking my personal account. My blog email addresses are now forwarded to one Gmail account, which I'll check regularly. So I'm catching up with belated replies. You may also have emails waiting for you unexpected places. By the way, your comments now go live without moderation. Hidden costs are annoying. The "nickeling and diming" can really add up. We know that most prices in Canada are subject to Goods & Services Tax (GST) and Provincial Sales Tax (PST). We're used to that. Some prices have unexpected add-ons. Take airline tickets. I normally use a travel agent when travelling on business or internationally on vacation. So I focus on the total price, not the components. Next month, we're vacationing in Banff. So we decided to book online through aircanada.com. The process is simple and easy --- almost enjoyable. That's $95.34. Add $32 for GST and the total is $127.34 per ticket. The disclosure is good, except for "Surcharges", but the total was unexpected. My wife says "That's not right" and my son asks "What're you gonna do about it?" Life insurance premiums already include provincial premium tax (which varies from 2% in most provinces to 4% in Newfoundland). There's no GST or regular PST. 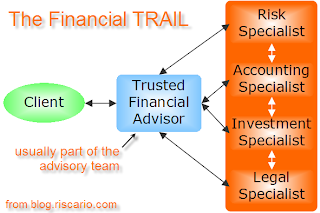 In financial services, trust is essential and there are many advisors are trustworthy. How do you find them? According to The Money Diva, "screening the monkeys for a good one would be more work than learning how to invest better". That suggests having no advisor or sticking with one who doesn't satisfy. As Thicken My Wallet says "the financial industry preys on inertia". The bigger issue is trust in society. Who can we trust anymore? Politicians? Religious organizations? Police? The stench from the few "bad apples" fills our nostrils, taints our perceptions. It's pretty sad when spinach, pet food and tooth paste aren't safe. 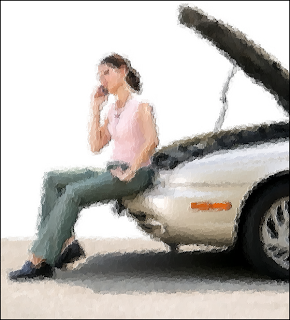 There are many trustworthy accountants, advisors, car mechanics, doctors, lawyers, etc. The problem is the effort of finding them. You can't simply do a web search. Referrals from someone you trust can be an option. They may not know or they may not be able to say (e.g., try asking a police officer for a burglar alarm company). 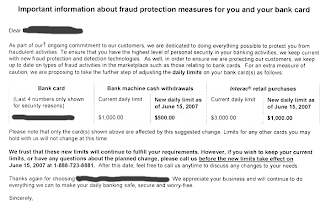 My bank is doing "everything possible" to protect me from fraudulent activities. That's reassuring. They're up to date with "new fraud protection and detection technologies". I'd expect nothing less. I'm happy. I don't want self-appointed Robin Hoods stealing from me. I bet there's great news. Let's read on. They are "proposing to take the further step of adjusting the daily limits" on my bank card. Downward. Huh? Maximum cash withdrawals are being slashed by 50% from $1,000 to $500. Debit card purchases drop from $3,000 to $1,000. That's 67% less! I don't mind these changes. Making spending harder = Making saving easier. I just need to freeze my credit card in a tin can full of water (see Three Practical Ways To Increase Your Net Worth). I'm worried by the subtext: the war against fraud is being lost. Those measures would be reassuring. Chopping usage limits sends the opposite message. And the nightmare will end. Sicko is not a balanced documentary. So what? 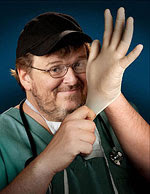 Michael Moore has things to say. We can benefit by watching, even if we don't agree with all his points. 45 million Americans don't have health care. The 200 million who do, may not be getting good enough health care because of the profit motivations of the private suppliers. The United States is alone (among comparable countries) in not providing public healthcare. The film shows that the average person can get better health care in other countries such as Canada, Britain, France and Cuba. How can a country without healthy citizens excel? The American for-profit healthcare industry is not shown in a good light. The poor perceptions can add to anxiety in other countries regarding the likelihood of getting claims paid for disability, critical illness and long-term care. Life often looks rosier in other places. France in particular looked like a country where life is much more balanced than it is here in Canada and the United States. Naturally, there are costs to providing the government services the French seem to enjoy. I felt sad --- very sad --- to see that 9/11 rescue workers have not been getting proper medical care. Their actions were so selfless. Sicko is well worth watching. You're sure to leave the theatre disturbed about the health care that Americans receive. Overall, I'm glad to be living in Canada with universal health care. 'Sicko" numbers mostly accurate (CNN, June 30, 2007): "... surprisingly few inaccuracies in the film..."
Today, the Canadian Institute of Actuaries (CIA) unveiled a prescription for the country's ailing pension system at the non-profit Economic Club of Toronto. The 6 page report is quite readable and part of the Institute's desire to help guide public policy in Canada. 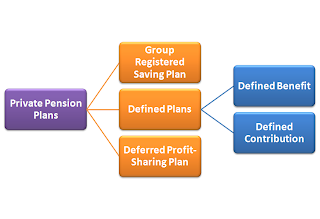 The prescription only addresses defined benefit pension plans. Defined Benefit or Defined Contribution? Fulltime employees in large companies usually get a pension through their employer. There are two common ways to convert savings into retirement income. Guess which type employers favour? Statscan reports that the portion of private sector workers covered by defined benefit plans has dropped from 29% in 1992 to 21% in 2003. Defined benefit plans are not perfect. Employer funding requirements fluctuate, which makes corporate financial results more volatile. As a plan member, what happens if you change employers or are self-employed? Portability is a problem. If you leave employers during the first two years, your pension benefits for that period are lost (don't vest). Plans can still fail. Plan assets can be used for purposes you don't support, such as offering incentives to others for early retirement. With defined benefit plans, the employer bears the risks and the employees get the rewards. If investment returns are poor, the employer must increase contributions. So if returns are favourable, shouldn't the employer be entitled to withdraw some of the surplus? If an employer tries, there's often an outcry. Hardly fair. Hardly an incentive for employers. Where's the Outcry for Defined Benefit Plans? At retirement, plan members find that their retirement savings buy less of an indexed annuity than they expected. At this point, what can they do? It wasn't clear what happens next. How will business owners react? Will politicians see a need to do anything? Do Canadians care? Are there other prescriptions that could help improve the defined contribution plans which predominate? The quote above has had me thinking for days. It's so true. When I started reading personal finance blogs a few months ago, I tried many different ones because they were novel. Now, I'm finding there are only a few I revisit. Time is scarce, after all. My preferred sites feel more comfortable, perhaps because I'm on a similar path already. Do you find the same yourself? For exposure to new ideas, we might read publications we'd otherwise skip or talk to folks we'd otherwise avoid. Even so, when it comes to being influenced, we're more likely to follow someone on our own path. 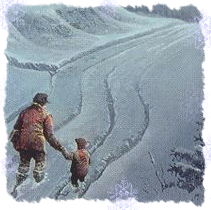 So rather than taking the road less travelled, we follow a tad further down a path we've already selected. Followers, not pathfinders. Maybe you feel the same? Q: What do you get when you cross a lawyer with the Godfather? Huh?!? Sometimes a well-meaning message raises more questions than it answers. Here's an example. The 407 Express Toll Route in the Toronto area can be a fast(er) way to get around ... for a price. I got a transponder to avoid the $7.10 video toll charges added to each round trip plus a monthly fee of $2.35 (see charges). The insert with this month's bill has an importance notice to help car renters save money. "We do not recommend using your transponder in rental vehicles as tolls, video toll charges and administrative fees will be billed to the rental company if your transponder is not read. If you choose to use your transponder in a rental vehicle, any tolls, video toll charges and administrative fees charged by the rental company as the responsibility of the renter." This well intentioned message is creating anxiety. Why wouldn't the transponder work in any vehicle? We have two vehicles and one transponder. I thought we could move the transponder between them, if required. Here's the unanswered question: What should you do when renting a vehicle? Without a transponder, won't you face the surcharges for for video toll and administration? Is there a special arrangement for rental companies? Maybe rental cars come with transponders already? Won't the rental company warn you if there's a better solution? Maybe they'll rent you a transponder? I'm sure there are answers somewhere, but why not in the important notice itself? The overall result is increased anxiety. Messages from other companies have the same unfortunate effect. I hope I don't need to rent a car anytime soon. "I care. But not t-h-a-t much." There's an interesting post about Managing the Cost of Home Maintenance and Repair on A Canadian and her Money. The idea is to setup a reserve fund for predictable and unpredictable expenses. This works well for condominiums because predicting is easier when there are many units. For one home, the statistical approach is less meaningful. Let's consider a simple example: death from an injury. The chances are 1 in 1,755 in a year and 1 in 23 during a lifetime, according to US statistics. How does knowing that help us as individuals? We're digital. Dead or alive. Similarly, our fridge works or it doesn't. Our roof leaks or it doesn't. The furnace breaks down or it doesn't. Each of these items has an expected lifetime, but how long they last for us can be much longer or shorter. So how to we plan? If the furnace is expected to last 15 years, and it's still working well, do we still replace it? Chances are we'll wait and perhaps get many more trouble-free years of service. Some expenses can be scheduled. If the roof needs replacing, you might be able to wait another year to free up money for "squeakier wheels". Saving is important, but budgeting is boring. Much like dieting. Many of us start, quickly lose motivation, quit and feel guilty. Worse off than when we started. An easier approach is to save money automatically by "paying yourself first" through automatic transfers from your bank account. This money can be used for savings and emergencies. In essence, we're self-insuring. So we're prepared for emergencies. If we're faced with unexpected expenses and don't like borrowing to spend, we'll feel out of our financial comfort zone. So we'll likely reduce other discretionary expenses until we're comfortable again. So even if we dip into our savings, we'll work to restore them. Here are three practical (i.e., boring) ways to increase your net worth. The best technique is to "pay yourself first". Have a portion of your pay (e.g., 10%) deposited into a savings vehicle from which withdrawals are more difficult. You're less likely to spend money you don't see. Similarly, you can save a salary increase (or a portion of it) instead of spending it. For those who don't payoff their credit card balances each month, an idea to pay for everything with cash. You keep one credit card for emergencies and cut up the rest. Put this credit card in a metal can, add water and freeze. Why? If you're tempted to make a purchase, you'll have to wait until your card thaws. By then, the urge to spend may be over. Why the metal can? So you can't use your microwave oven to reduce the wait time. Learning is also a strategy for remaining employable in the uncertain days ahead. Learning doesn't have to be in a classroom setting. You can learn plenty online for free using your favourite search engine. Blogs are an excellent --- and interactive --- tool. Investing is a contentious topic. Who doesn't have an opinion or two? Relying on the advice of others over the years, I've lost money in shares, mutual funds, warrants, etc. Our current focus is paying off our mortgage while getting better educated about investing. These ideas are related. 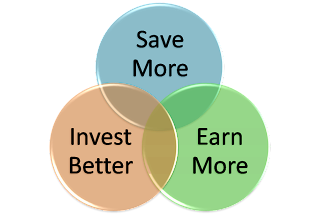 Saving more and learning more help in investing better. Learning more is a form of investment. You can can the increase in your earnings from the increase in your learning. Do you have other practical tips? Brian was discussing ways we can make more money. Unlike many others who discuss this ever-popular topic (see Too Good To Be True), his ideas work. But take work. Brian explained that a Mercedes car is lost on the back roads. In comparison, a rusted jalopy on the highway goes faster and further. Our mind is like the Mercedes. We need to put it on the right track. Aside: can't someone who can afford a Mercedes buy a GPS navigator to get back on track? We are our most important assets. The world is moving ever-faster. If we don't continue developing our skills, we aren't standing still. We're falling behind. Eventually we're so far behind that we think we're first. Self-esteem is critical and ours can suffer for many reasons, starting with how we were raised as children. We can replace the negatives with affirmations such as "I like myself" and "I love my work". Frankly, I was skeptical when I learned of affirmations from his video seminar "Achieving Personal Excellence" back in 1992. I tried them though, and they work. Try your own. With enthusiasm! While these ideas are available from other sources, they were new to me. He explained in ways I could understand and apply. As I was dragged out, Brian was talking about the Efficiency Curve, borrowed from the Boston Consulting Group. As we learn, our work takes less and less effort.